"…this special community family day was a wonderful success, and you …were responsible for a large part of it!". 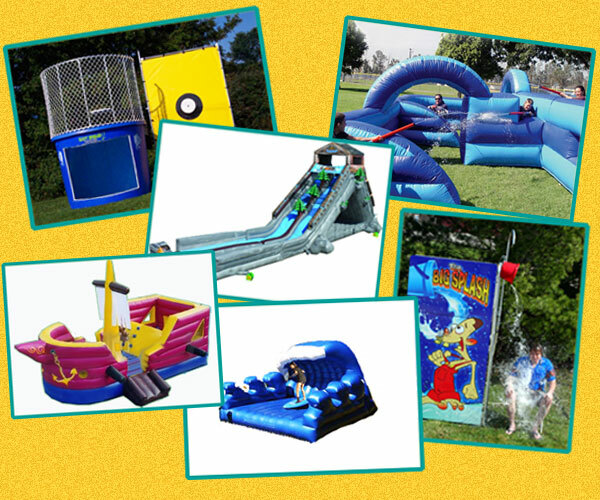 Stay Cool During Those Hot Summer Days With Our Wet and Wild Rides & Games!! 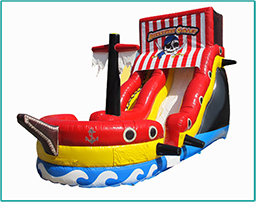 From Luau and Pirate themed parties to everyday events where people want to cool down while having fun, our water activities are a great way to add a splash to your event! 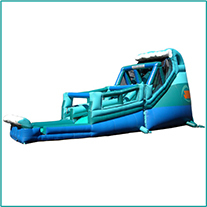 CHECK OUT THE WATER RIDES BELOW! Scroll to browse or click on the link for those specific items. Note: Because we regularly update and refresh our units, designs, colors and dimensions may vary slightly from what is shown. 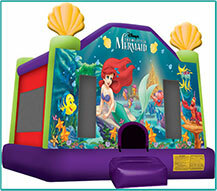 All bounces and rides require proper supervision if an attendant is not provided. huge tank. The open window in the tub makes it even more fun! Great for bosses, teachers, or any other “SPECIAL” people! 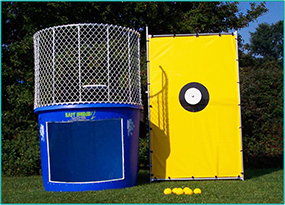 Hit the target and dump a bucket of water on the person. 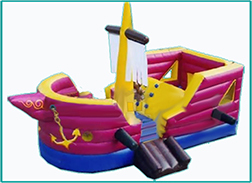 water slide for the ultimate Pirate Party!!! Water access within 50‘ if used wet. Electrical Requirements: (1) 10-amp, 110 volt outlet within 100‛. 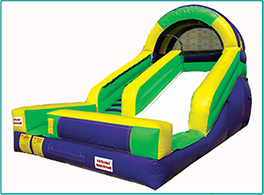 This giant slide features a midway hump for extra fun. 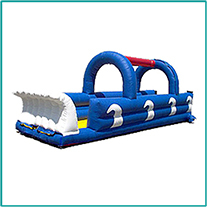 Add water for w ater slide fun!! Water access within 50‛ if used wet. 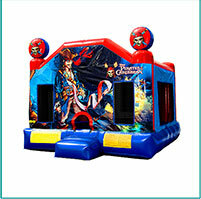 Electrical Requirements: (2) 20-amp, 110 volt outlet within 100‛. 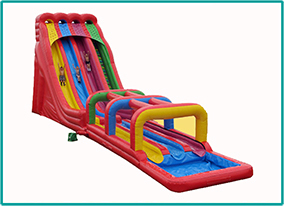 This large slide is great with or without water! 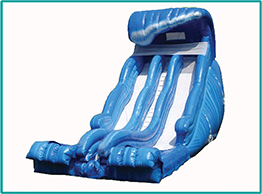 Available as a stand-alone slide OR as the perfect slide for pools! Having an aquatic themed event? Here‛s the perfect slide! 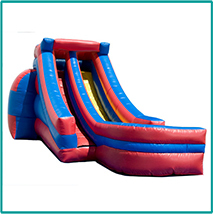 this slide is a great addition to any event! 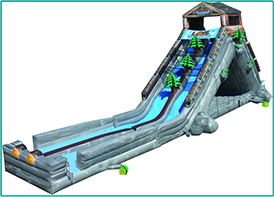 Race each other on this awesome DUAL SLIDE!! Electrical Requirements: (1) 20-amp, 110 volt outlet within 100‛. 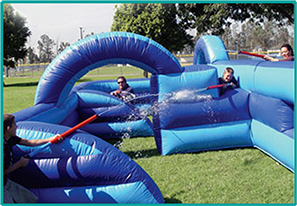 8 water guns and 2 buckets as you defend the inflatable fort! 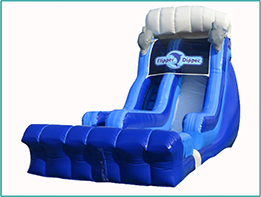 Get wet & wild with this awesome water slide!! rails. Perfect for kids 13 and under! E lectrical Requirements: (1) 10-amp, 110 volt outlet within 100‛. 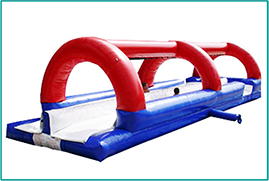 Set-up Requirements: Flat surface, paved or grass, 16‘ x 77‛. 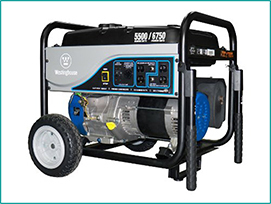 Electrical Requirements: (4) 10-amp, 110 volt outlet within 100‛. you slide down the track! 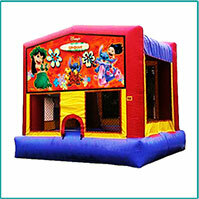 Set-up Requirements: Flat surface, paved or grass, 6‘ x 32‛. W ater access within 50‛. 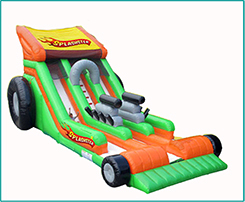 Race your friends on this dual track version of the Slip ‘N Slide! 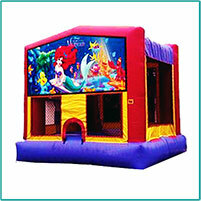 Set-up Requirements: Flat surface, paved or grass, 12‘ x 34‛. 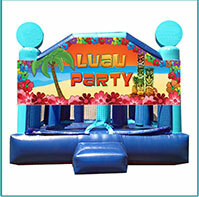 Bring your luau to life with this Hawaiian themed slide! 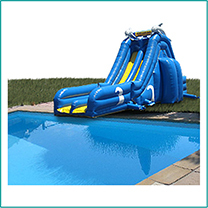 Features DUAL lanes and a splash pool for awesome fun! 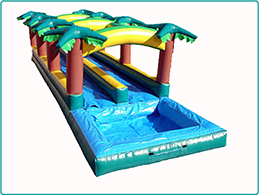 Set-up Requirements: Flat surface, paved or grass, 12‘ x 39‛. features a wider and shorter lane! 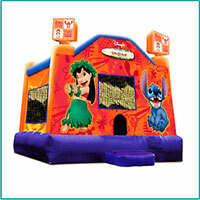 Set-up Requirements: Flat surface, paved or grass, 11‘ x 26‛. Electrical Requirements: (3) 10-amp, 110 volt outlet within 100‛. events. 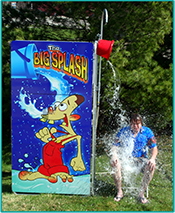 Add water for event more fun!! 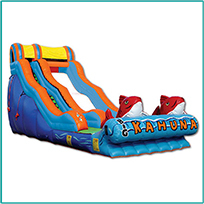 This dual slide is perfect for those sizzling summer days! Electrical Requirements: (2) 10-amp, 110 volt outlet within 100‛. wall. Also includes 2 windows and a climb through steering wheel! Electrical Requirements: (1) 15-amp, 110 volt outlet within 100‛. 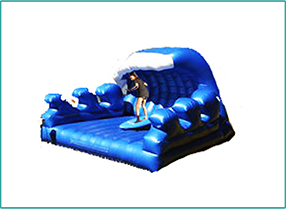 players fall onto a soft inflatable surface below! 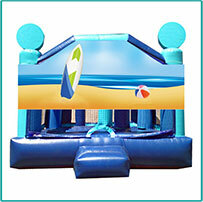 Kids LOVE our water themed bounces!! Add optional tunnles and other obstacles for even more fun! Call for additional details to assure enough power for your event! can play! Optional prizes are also available!